The view from our makeshift beds wasn't too shabby! “Ready to go?” my friend Mike asked, as I finished a beer while I sat in his living room. I told him that I was as I made my way towards the door. I tied my boots and started layering up. I finished with a rain coat, then slung my Volta onto my shoulders. Time to go. Typically I don’t camp during the week but I’ve felt extra stressed here lately, and desperately in need of a night sleeping outside. Luckily for me, my friend Mike is doing some condition testing on his kit; he’s riding the inaugural American Trail Race in June, and it’s better to figure out what might be wrong with your gear when you’re near home rather than 1000 miles into a 5000 mile race. So, he’s spending the week stealth camping around town, and I decided to head out with him for the night. 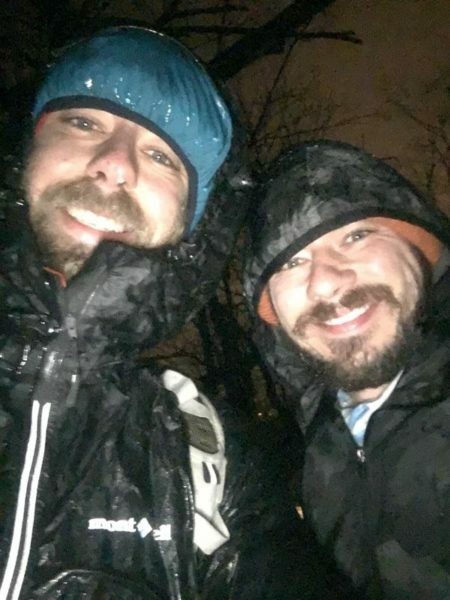 So at 10pm on Wednesday, bundled up against the wind and rain, we stepped out his back door and started walking. He seemed to have an idea of where he was going, so I just followed as we chatted. Ten to fifteen minutes later, we stood on a flat area on the side of a wooded hill, looking down at the lights glowing on the city streets. The view from our makeshift beds wasn’t too shabby! We pulled our kits out of our packs. Mike’s set up is faster, but I didn’t take too long to get myself situated either, and before long I was somewhat comfortable in my sleeping bag and borrowed bivy sack. It didn’t take me long to start sweating. At about thirty degrees, I still found it hot layered inside both my bag and the bivy. I stared up at the sky for a bit and as I started to doze I scrunched down inside the sack as much as I could, trying to seal it against the impending rain. Then I drifted off into a decent sleep. A couple hours later, my mind stumbled towards wakefulness as I realized my head and chest were wet. “Am I really sweating that much?” I thought to myself as I shifted around to reach up to my face. It was pretty tight in the bivy, so this required a fair amount of wiggling, and at that point I realized that water ran alongside my sleeping pad too. I knew I didn’t sweat that much and my brain started to wake up a little more. “I’m getting rained on!” I shouted in my brain as I propped myself up. I must have gotten hot in my sleep and opened up the mouth of the bivy. I moved and shifted trying to tuck myself further into the bivy so that I could stay a little dryer, but it was just too small to work. “You okay?” Mike asked. My wiggling and repositioning must have woke him. I sighed, then said “I don’t know, I’ll sleep on it.” and shoved my body as deep into the bivy sack as it would go, and held the opening shut above my head. It wasn’t perfect and I would still get wet, but I would stay warm enough. It was discomfort, not danger, and I decided I would try to stick it out a bit longer. I slept fitfully for another few hours, stuck in that odd cramped position, still taking on water. Kudos to my sleeping bag, however. I’ll say this much, despite being pretty wet, it kept me plenty warm! We packed up quickly. As I wrung out my sleeping bag, I realized that my pad was floating on top of the water in the bivy sack. Eek! Eventually it would have filled up with me in it. I deflated the pad and stowed it, then drained the bivy and packed it up. Outside of the sleeping bag I got cold pretty quickly, but once I had my layers and rain gear back on, I was in serviceable condition. We snapped a photo, laughed about the situation, then started back. I warmed up quickly as we hiked and joked around, and I felt pretty good about the whole affair. 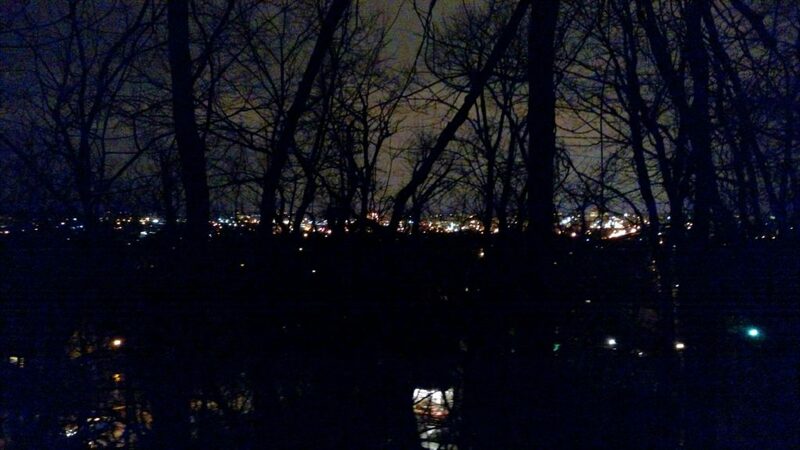 The night didn’t go perfectly, which was kind of the point. 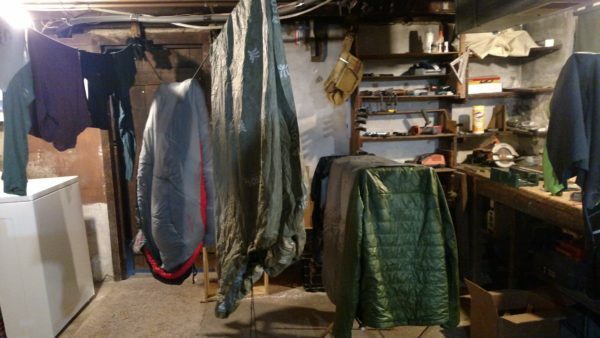 Mike knows he needs to change the bivy sack situation before the American Trail Race, and he still has plenty of time to do it. As for me? Well, things have felt a little nuts here lately, and sometimes the only way to fight crazy is with crazy. After I got home, I started thinking about the evening in the broader context of adventure as I hung my soaked clothing and gear up to dry in the basement. Despite ending sooner than expected, I enjoyed this little microadventure, and it made for a nice demonstration of something you can do if you don’t have a lot of time or money. Stealth camping lives in a gray area of legality, depending on where you set up, so do a little local research before committing, and of course, do no harm and leave no trace. Also, consider a less rainy night for your first try. Beyond the idea of microadventuring, I also thought about what this evening meant for Mike, and how this is essentially preparation for his upcoming race. I thought about how every day can be an adventure if you look at it the right way; the adventure isn’t just the summit or the finish line, it’s everything you do to get there. Taken with the long view, your whole life can be part of the adventure. It’s about what you make of it. Everything hung up to dry. The last of my clothes hung up, I made my way upstairs as my mind sleepily wandered. Stealth camping didn’t work out perfectly, but I was happy. Yes I had gotten soaked and cold, but I still considered the night a win. As I climbed into a warm comfortable bed, I thought about how grateful I am for all the things I have in my life, and how lucky I really am. Finally, as I drifted off to sleep, I dimly started imagining my next outing, and how I can improve the experience. The adventure is never over. What soggy fun! I don’t have a particular desire to experience this again having been there and done that on a very first week of a walking holiday in Ireland many years ago. Eventually the wetness beat me and I hopped on a train, went back north, dries out thoroughly and hopped back on the train to pick up where I left off. A week later I was soaked again but fortunately the following day was right and sunny enough to dry me out “on location” (Kilkenny). My experience was partly the result of a leaky tent – was your bubbly bag leaky or what? I would have hopped on the train too! I can endure for a night, but I’m not sure how much longer after that. Still, a walking holiday in Ireland sounds quite lovely, and I’ll perhaps have to keep that idea in mind for the future. My sack didn’t leak, but I couldn’t get it adequately closed above my head. It didn’t breathe very well so I built up a lot of sweat while I was there too. All in all, a fun night, but I’m eager for drier weather! Well done for sticking with it the first time you realised you were getting wet. As you said, it was danger, only discomfort. But a good discomfort. I have also been stressed and in bad need a time outside and not slept much once outside. But the experience is always rejuvenating. It really is like a refresh button. Everything falls back into perspective and stress melts a little. Do you have another one planned soon? I really hope all that rain is going to stop so you can enjoy a dry night. I feel you, even my rainy night helped me feel a little more in control the next day, even if I was a bit tired. My hope is to take a little trip this weekend. The forecast is for things to dry up tomorrow and be sunny and reasonably warm until Monday. It’ll probably still be a little soggy where I plan on heading, but will hopefully be doable!